We're very excited to be hosting our first ever blog hop here at CrafTangles. At each hop you'll get inspiration from each of the Design Team members who have been busy creating with stamps from the April 2018 Release. In order to be eligible for a prize you must visit all the blogs above and leave a comment. CrafTangles will choose 2 winners who will each get a goody bag! The blog hop will run from 30 May 2018 09:00 (IST) to 3 June 2018 21:00 (IST). Two winners will be chosen by random.org and announced on this blog the following week. So what are you waiting for?! Please leave a comment below then go on to visit Rahmat on her blog! Wow.. Awesome blog hop...really enjoyed unique creation of each member..
Really enjoyed the hop with such creativity! Each one has their unique styles and love how they showcasing the stamps with simplicity!!! 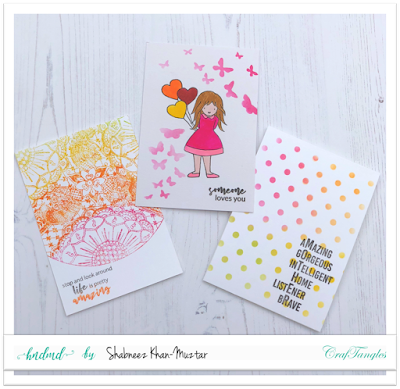 This Blog hop is so much fun and creative.. Really enjoyed it and learned different perspective's on each stamp and stencils by different people.. Thanks for the hop.. Enjoyed hopping along and getting inspired by the cards shared ! I love these blog hops...learned different techniques too..all the projects are amazing. Marvelous creation by the DT members. Enjoyed hopping! Loving all the beautiful trios from teamies, awesome job girls, way to go! Thank you for the opportunity to enter to win some lovely goodies - your DT have provided some great projects for inspiration. the DT ladies have made beautiful and sweet exsamples cards. I love this website and am new to blogs. Really liked the blog hop concept. I am truly inclined to cardmaking now. I am glad I subscribed to craft angles. That's a great start...blog hops are always fun and great way to share learning...all the cards shared are awesome..Keep it up girls!! Lovely Creations😘😘 ... Inspired... Never miss out hopping at this blog..
Blog hops are always great,u get introduced to new artists ,learn new techniques and u leave with so many inspirations. Great projects by everyone. Your products look wonderful, love what your designers are making. Thanks to my lovely friend Shabneez for pointing me in this direction - I would love to win some of the goodies she's been using for you! Awesome blog hop...Thanks for the giveaway. I am so excited! Hope more Indian companies start having blog hops. I am also looking forward to seeing the CrafTangles products in action. So glad to see a blog hop here. I don't know how did I miss seeing this. Hopping to learn more by your awesome DT! Thanks for opportunity to win.